This is the first anthology put out by The Infinite Process, comprised of selected stories ranging from science fiction to historical memoirs and written by students from around the world. 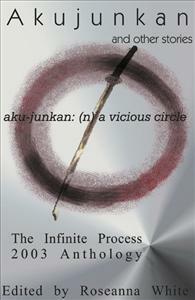 Akujukan is the first anthology put out by The Infinite Process. It includes the title work by Alison Klesman, “Prey “by Robin Roberts, “Christobel” by Amelia Mangan, “Friday Night” by Mac Carey, “Unable” by Katherine Carissimi, “Somewhere Beyond the Sea” by Megan Kirkpatrick, “Warmth of Sun” by Stack Uykimpang, “Bicentennial Bliss” by Greg Vest, “Almost, but Not Quite” by Kelly Watson, “English Language” by Mary Lynch Fuller, “The Impact of September 11th” by Sierra Crane, and “September 11th” by Adriene Brown. The stories and authors are all diverse, and promise a peek into tomorrow’s leading works.